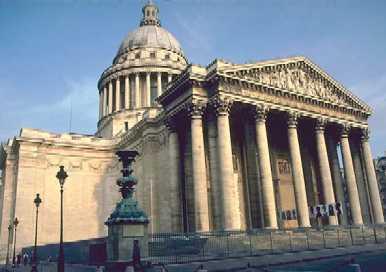 The Panthéon was originally built as a church, on the orders of Louis XV, as a monument to Saint Geneviève. He had it built after he recovered from a serious illness that could have killed him. 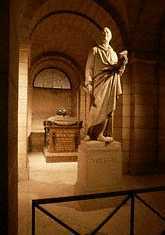 The building wasn't completed until 1789, and the French Reveloutionaries converted it to a necropolis for famous French people. 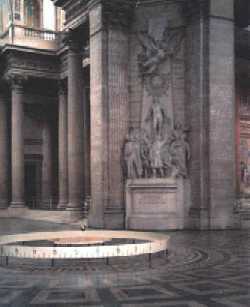 Foucault conducted his famous experiment with a pendulum in this building. Inside (picture to the left) a replica of the pendulum still swings slowly back and forth. There's Voltaire on the left. Some of the other people buried here are Marie Curie, Victor Hugo, Émile Zola, and Jean Moulin. These are in the crypt beneath the church.